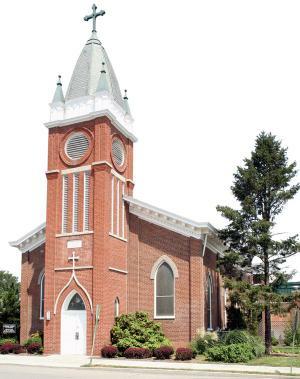 Daily — Mon-Fri: 8 a.m.
Tuesdays — 9 a.m.– 9 p.m.
Annunciation Parish originated in 1855 when Father John H. Bekkers made his first trip from the Cathedral of the Assumption in Louisville to Shelbyville. Father Bekkers visited every three or four months to encourage the Catholics in Shelbyville to establish a church of their own. Land was donated in 1859; the newly constructed church (the current chapel) was dedicated on October 2, 1860. At first it consisted of only wall frames and rough floors. Through a series of additions, the chapel took on the present form. Father Michael D. Lawler was the first pastor. Other buildings and supporting structures were added to Annunciation over time. The rectory was expanded in 1910. In 1975 it was completely remodeled from a frame house to brick. The education building was constructed about 1967. The Cotter Center was added in 1999 and serves as a wonderful space for staff offices, religious education classes, and other church activities. Plans were drawn up for a new worship space, and the new church was dedicated on February 6, 2000, by Archbishop Thomas C. Kelly, O.P. The Hispanic faith community is an integral part of Annunciation. Shelby County has seen a steady growth in the Hispanic presence going back as far as 1972. In 1987, Sister Lupe Arciniega, S.L., started an outreach ministry. In 1997, the Centro Latino was established to provide emergency assistance, counseling and help with health, education, and legal needs. Annunciation Parish, now with more than 2,400 parishioners, has responded with bilingual Masses and group hospitality to new parishioners.